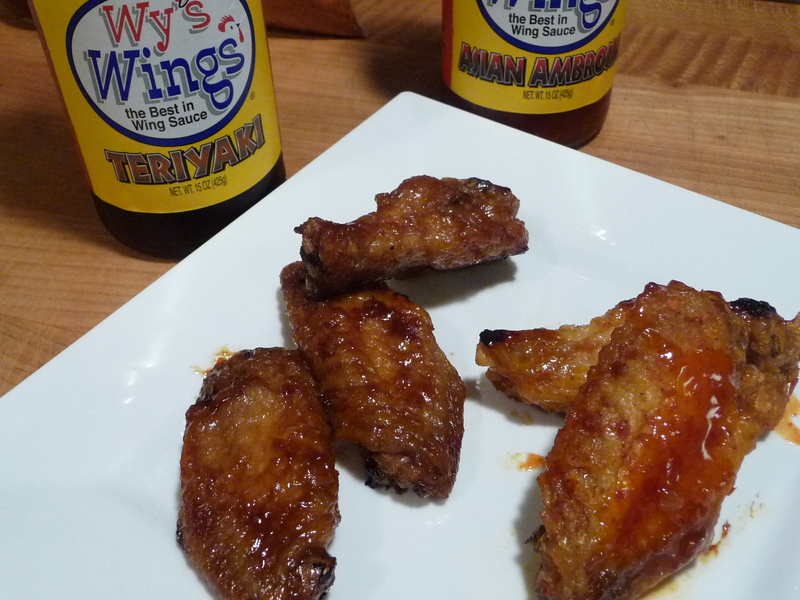 Our Asian inspired entry this year, for our Week of Wings series, is from Wy’s Wings, headquartered in Northern Virginia. 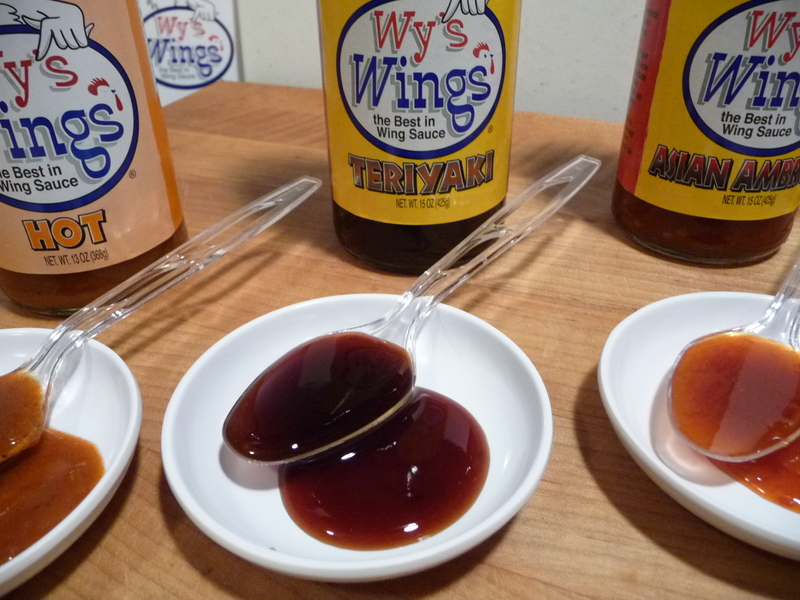 On one wing we have a thick, dark, sweet and sticky Teriyaki sauce, and on the other, a sweet, slightly spicy chili sauce. 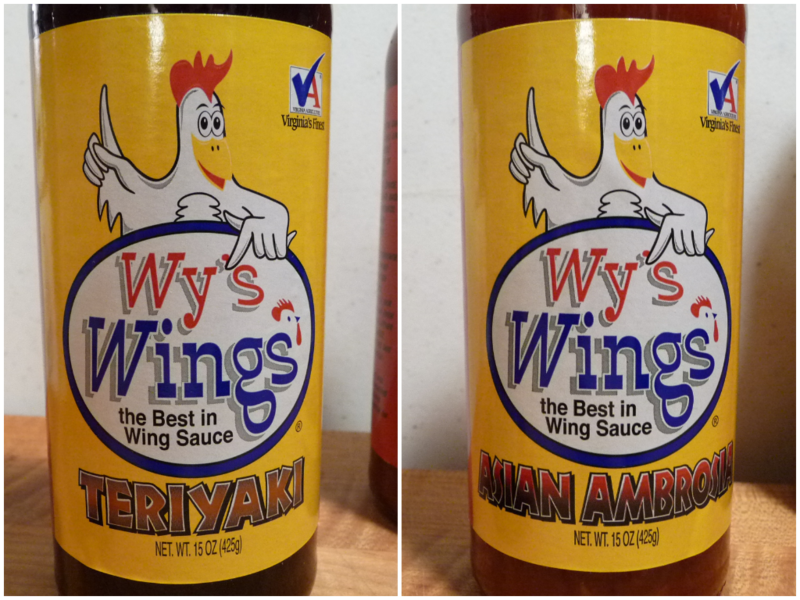 We cooked up a batch of fried wings and doused them in these two Wy’s sauces. We par-baked the wings at 350 degrees for about 40 minutes, flipping them over half-way through, then deep fried them at 360 degrees for about two minutes. It’s our usual method for deep frying wings. Our Wings 101 has all the tips and details. We gave them a quick rest on paper towels to get rid of the excess oil, then tossed them in these amazing sauces. Ingredients: soy sauce (water, wheat, soybeans, salt, sodium benzoate), brown sugar, water, mirin (water, rice, dextrose, corn syrup, salt), modified food starch, vinegar, garlic, spices, onion, salt. Texture & Appearance: A beautiful, shiny, translucent, gorgeous sauce. Dark and shiny and very sticky, it was surprisingly light bodied on the wings themselves. Taste Straight Up: This is a great teriyaki sauce. You could stir fry anything in this and it would be fantastic. You can taste the mirin and the soy (of course), and I’m so pleased that it is not too salty or too sweet. There is a great silky feel on the tongue, and it’s better than any other teriyaki sauce that I’ve ever tried. 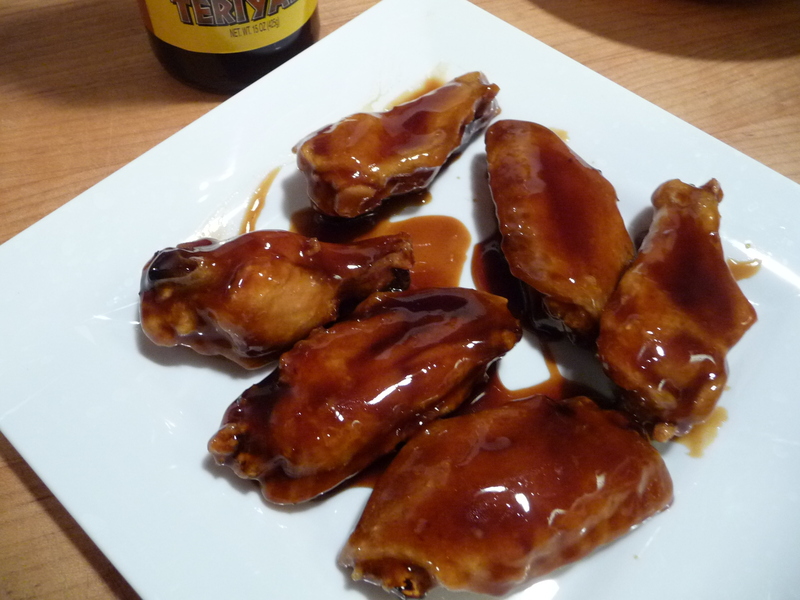 Though not your “typical” wing sauce (cayenne, butter, etc), if you love teriyaki wings as much as I do, this has got to be in your kitchen or fridge. It has a wonderful consistency that clings beautifully to the spoon. Taste on Wings: This smells so good while we’re tossing the wings in the sauce. Brian likes to let them soak a while, and I just want to toss, put them on the plate, and let the heat from the wings set the sauce. Either way, the finished product will give you beautiful wings, with a lovely shiny finish. Though still brown, they are surprisingly light in color considering the darkness of the sauce, and not as thickly coated as we thought they would be – just a nice light glaze. Delicious, only slightly sticky, this will be my go-to sauce when I want a teriyaki wing, AND this sauce will now be the one I use for my teriyaki stir-fry creations. Goodbye, Kikkoman, hello Wy’s! Ingredients: water, chili peppers, high fructose corn syrup, sugar, garlic, vinegar, salt, orange juice concentrate, soy sauce (water, wheat, soybeans, salt, sodium benzoate), modified food starch, ginger, natural flavorings, spices. Taste Straight Up: Labeled as a Thai Chili sauce with garlic, this sauce is very smooth. I can taste the garlic in the background, and it’s not as sweet as a normal Thai chili sauce. Brian detects something dry, but I think that’s just the dried flakes of red chili peppers. The bits of garlic are moist and tender, creating a lovely umami balance. Not overly sweet, not too thick, and not gloppy like other chili sauces, this should coat the wings nicely. This sauce, like the teriyaki, clings to and coats the spoon – another Wy’s sauce with perfect consistency. Texture & Appearance: A very light-colored orange sauce with bits of red pepper flakes and garlic bits that are nice and tender. A very pretty sauce and not as thick as most Thai chili sauces. This looks promising! Taste on Wings: This is one of those sauces you might want to dip your wings in after they’re cooked. Brian had to smack my hand as I found myself wiping my fingers through the drips of sauce on the plate. (In my defense, I was just cleaning up the plate for the pictures!) The finished wings have a very pale glaze, with a brighter color than the Teriyaki. These are beautiful shiny wings with bright red bits of the chili pepper. Sweeter than the Teriyaki wings, this is my “wow” of the two sauces. Overall Rating / Final Thoughts: – I loved the Teriyaki, and they get 5 stars from me for a teriyaki wing. The Asian Ambrosia, however, would get 6 stars if we had that rating. Yep, I loved them that much! 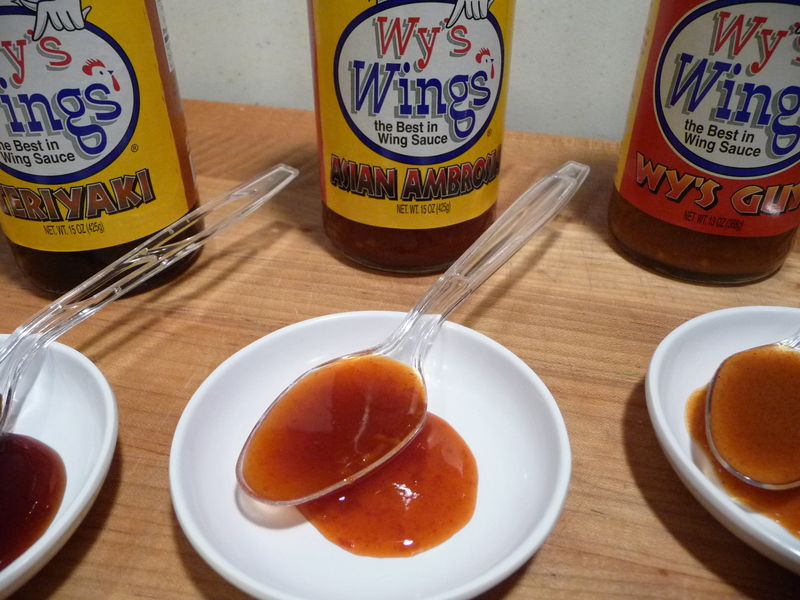 Shop for Wy’s Wings online and stay tuned for new sauces that Wy’s will be launching very soon! About our Week of Wings series: This is the 4th year we dedicate a full week of reviews, recipes and posts to the Hot Wing. Enjoy and explore our other Week of Wings posts for inspiration and wing-ness! I took the advice on the bottle of Ambrosia – I mixed 2 parts Asian Ambrosia and 1 part Teriyaki, and put that on some leftover wings. Amazingly good! That combo could be a sauce unto itself! These are two stellar sauces – some of my favorite non traditional wing sauces out there. I think Mark is looking into bottling the ambrosia and teriyaki mixture. It is a great combo. I think you are correct, Mike. Mark told me he was either planning on that, or is already underway to produce a new sauce based on these two. Yes, the new sauces is a 50/50 blend of both the Teriyaki and the Asian Ambrosia. It is drawing RAVE reviews and we are in the process of marketing it in its own little world starting w/ its own website. That one is already being bottled in gallons for our foodservice customers, one of which is Ben’s Next Door in D.C., one of my favorite eateries otherwise when I’m in that area. Also on the front burner, a Jerk. We hope to move all of our non-traditional, AKA non-Buffalo Wing Sauces over to that new brand once it is established. Doing this in order to avoid the pigeon hole that the Wy’s Wings name gives to the sauces since they can be used for much more than wings. As you mentioned Brian, that Teriyaki is fantastic for use as a stir-fry sauce, and as with you, it too replaced Kikoman’s stir-fry sauce for me here at home. I cut it w/ water. It goes even further that way. Mark, you’ve outdone yourself with this sauce, and I can’t wait to try the new blend! Ahem, yes, I thought I wrote a pretty glowing review….. Brian DID take the pics though, LOL! I’m going to be doing a stir fry chicken/veggie dish soon, and will be sure to let you know how it turns out. I’m sure it will rock! Thanks for these reviews! Anchor Bar is still my favourite but we don’t get too much choice here in the UK. I’m not sure what I think about these though, not sure if I could drag myself away from the salty cayenne type wing sauce. Chilli Hunter, these are a totally different animal ( um, still chicken though). Sweet, savory, sticky, just what a teriyaki lover like me wants! Thank you for commenting. It’s great to see that folks across the pond are reading our posts! Beyond the cayenne-buffalo-style wing is a whole other world of wings and flavors. Peruse our complete Wings category to see what I mean… garlic, sriracha, BBQ, salt & vinegar, cajun, dry rubbed! The list is endless. 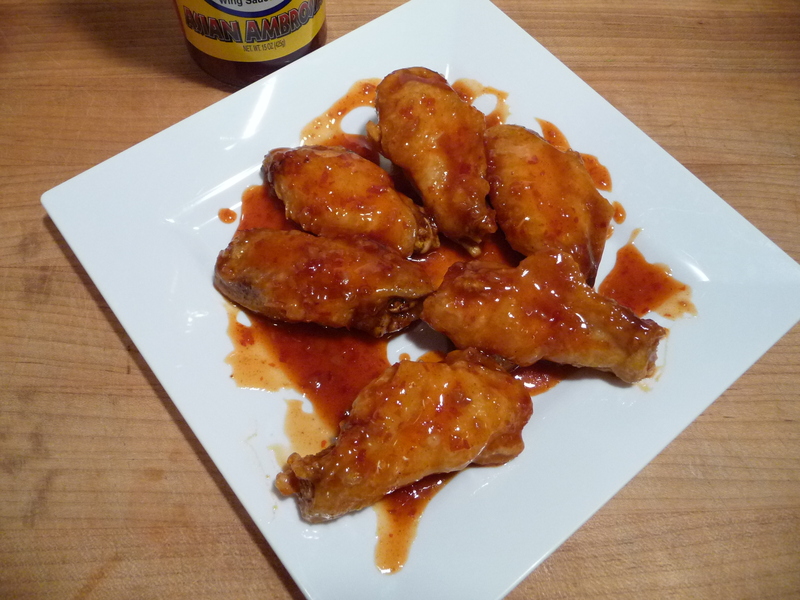 Branch out and try something different from the normal butter/cayenne sauce/wing. Your taste buds will thank you for it! Sounds delightful. Question about the teriyaki sauce, have you ever tried Mr. Yoshida’s and if so, how does Wy compare in taste and consistency? Yoshida’s is our current teriyaki of choice but that Wy’s looks good.